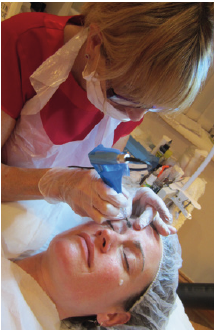 Gillian Huntley, 2015 Kent Aesthetic Practitioner of the Year, of award winning appearances is celebrating 30 years in the industry this year and her treatments have really helped transform the lives of her clients by boosting their confidence through the non-surgical procedures she offers. As well as specialist treatments such as mole removal, mesotherapy, thread vein/pigmentation removal, skin peels using the Image Skincare range, skin tag removal, Gillian also provides semi-permanent cosmetic treatments such as eyebrow (WoW Brows) and eyeliner tattooing, areola reconstruction, receding hairlines and medical tattooing. Gillian’s own clinic is in Chislehurst but she sees many of her local Edenbridge clients at Options Beauty Salon in the High Street. 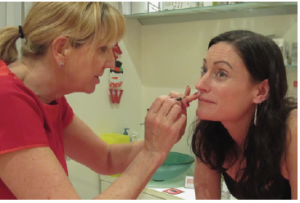 All her treatments are carried out to the highest possible standards and she also holds all the relevant certifications required so you can be assured you are in safe hands. There is no rule as to where the perfect ‘spot’ might be located and after the first three spots Gillian drew on me I didn’t think I’d be going through with the treatment. It wasn’t until Gillian drew the ‘Von Teese’ on my face that I could feel my mind changing. It can be quite a big decision to make on your own and I was glad that I had brought my friend Julie along to this particular session. Gillian was more than happy for me to bring a friend and Julie was very interested in finding out more about the treatments Gillian offers. I could see from the look on Julie’s face (believe me I know her well enough to be able to read her expressions) and without her even saying a word I knew she was in agreement – this was the one – it was fun, looked natural so why not? So with that Gillian began the preparation procedure for my new semi-permanent beauty spot. As with all the semi-permanent make-up treatments, the process begins by ensuring the skin is clean (so make-up off) and a numbing cream is applied to make the process more comfortable. As well as having the beauty spot tattooed Gillian would also be applying the second application of my ‘WoW’ Brows, the tattooed eye-brows I originally had done a few months ago. Just look at the picture below to see the difference. 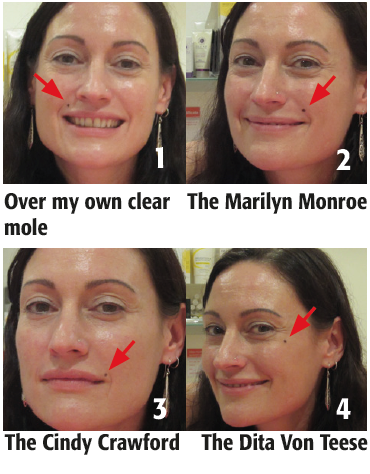 Semi-permanent make-up can be used to enhance your features or even to create something that isn’t there. Gillian has been able to ‘disguise’ webbed toes by creating the illusion of a gap between the toes. The pigment (colouring) used for the make-up is mixed individually for each client as different tones suit different complexions. Gillian has an extremely good eye in making colour to match her client’s features. This process is similar to having a permanent tattoo as there is a needle used to place the coloured pigment under your skin. The difference with semi-permanent tattooing is that the needle does not penetrate the skin as deeply as it is often carried out in very sensitive areas. So what if I decide I didn’t want the beauty spot anymore? Well, it will fade over time, disappearing completely in about 2-3 years. If I want to keep it then an annual touch up would be all that is required. Following any procedure, Gillian gave me my aftercare instructions which includes cream to help the areas treated heal properly. You do have to be careful with the areas for a few days until they heal properly – a process I’m getting rather used to! 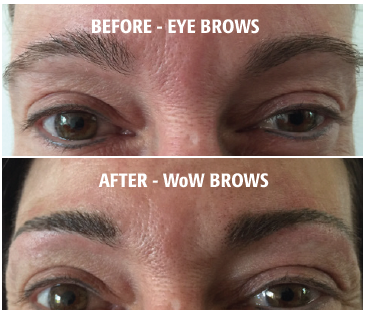 If you would like to arrange a consultation with Gillian or book an appointment for WoW Brows, beauty spots or any other treatments she offers, call her on 07711 067 789 or email her at appearances4u@me.com.